I love cauliflower be it a curry or paratha i just love this curry apart from brinjal. 1.Heat oil in a kadhai and deep fry cauliflower florets till golden brown. Drain on absorbent paper and keep aside. 2. Mix onion paste with ginger-garlic paste, turmeric powder, red chilli powder and coriander powder. Keep aside. 3. Heat oil in a frying pan and saute chopped onion with whole spices till onion is golden and spices release flavour. Cool and grind to a paste. Keep aside. 4. Heat 1 tbsp oil in a frying pan and saute the onion-ginger-garlic paste. Mix in tomato puree. 5. 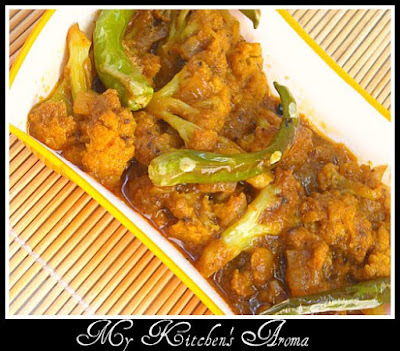 Mix in onion-spice paste, add cauliflower and water and cook till cauliflower absorbs the flavour and gravy thickens. Heat oil in a tadka spoon and fry the green chilli whole. 6. To serve, arrange florets in a plate and pour gravy around them and place fried green chilli on top. Perfect side dish for roti looks yumm and liked that fried geern chillies on the curry. Do u watch Masterchef India ??? I stopped watching becos of Akshay's arrogant attitude.. 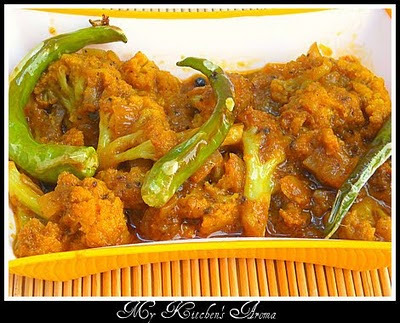 Delicious side dish for rotis, lovely..
wow, that looks simply superb !!! Wonderful dish - very tempting!! Love the first pic....looks super yum!